Our Little Guy is 24 months! We have been having lots of fun with Tot School lately! The weather warmed up one last time where we live, giving us an opportunity to swim last weekend and this weekend. Yay! So to go along with the weather we did a few ocean-themed activities to learn about the ocean in English and Spanish. We are linking up with 1plus1plus1equals1.net for Tot School Week 35. Be sure to head over there and check out all the other awesome Tot School ideas! Over the summer I have been getting inspiration and ideas for ocean activities from Pinterest of course. You can check out my Ocean Board here. Also, Gift of Curiosity just did a great series of Ocean-themed activities and book lists. 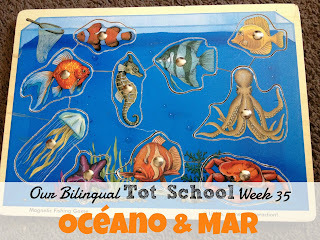 And for some bilingual fun, check out this cute ocean craft idea from Toddling in the Fast Lane. I still want to do a few crafts like the hand-print crab, but we ran out of red paint due to Jefe's late night escapades, so maybe this week we will get around to that. Here is what we did with what we had on hand at home. I had found this fun Melissa & Doug Habitats Reusable Sticker Pad on sale at Office Max last year and thought it would be fun to use for mirror art. We found a recipe for washable window paint and mixed up some blue green to turn our mirror into an ocean habitat for our ocean animal stickers. First we hung up all the animals. As I peeled off each reusable sticker I said the name of the animal in English and Spanish. Check out the chart below of all the ocean animal names we are learning (pronunciation included)! Stickers are perfect for strengthening fine-motor skills, and the nice thing about the reusable ones is that you can take them off and readjust them and they do not get stuck to themselves, making toddler frustration less. Usually when we do a project or craft I always have an idea in my mind of what it should look like, but I tried really hard this time to let Little Guy take the lead and encourage him in how he wanted to make it. I only helped him re-situate the sticker if he wanted help. It was neat to see his creativity at work...something I guess I have not done with him much yet. Then I dipped the sponge brush into the paint, modeled a wavy line and said, "Look we can paint an ocean...el mar!" Next I handed the brush to him and let him at it! At the end I labeled it "mar" which is the word for "sea" in English. Jefe woke up from his nap as we were finishing up and wanted to add a few waves himself. I did not realize what a fun project this would be for Little Guy and how proud he would be of it! Every time we go in the bathroom he sees his masterpiece and says, "Look what I made!" So glad we are doing Tot School and that I am able to take intentional time to play and create with my Little Guy! Another day we got out this fun puzzle from Lights, Camera, Interaction! that my mom gave us--kind of like this Melissa & Doug Magnetic Fishing Game . Little Guy would not have anything to do with the fishing pole. I tried to help him a few times, but it was too much work. He just wanted to use his hands. Guess we will work on that hand-eye coordination later! For bath time we got out our TOMY Do-Re-Mi Dolphins Bath Toy . It is a cute little set that has dolphins which float inside a matching colored ring. The rings all click together and if you tap on the head of the dolphins they actually whistle out a note. We are missing some of the dolphins by now, but it was still a good exercise in matching colors and talking about them. And of course we talked about them in English and Spanish. Here is a playlist of songs we like to watch about los colores in Spanish. Later in the week I dug out these ocean paintable scenes from Red Farm Studio. It is amazing what you can find just around the house. I did not spend any money on our ocean activities, just used what we had at home. As you can see, Jefe watned a turn too. He painted the tortuga. After we painted we went into their room to just play and as my Little Guy was linking up toys it started to look like a circle, which gave me an idea. I ran to get the masking tape and made an "O" for océano and "M" for mar. It is funny as I look at the pictures and realize it spells "om." Then we decided to make the "O" orange, because orange starts with "O" too! Sorry the pictures are a little blurry--I had to snap them fast in all the action. Here they are all tuckered out from playing! We used the same pool toys when we came home to make a shape-matching activity. I got out our dry-erase boards and our Crayola Dry Erase Crayons and we traced the toys and talked about their names. We also got out our First Thousand Words in Spanish and turned to the page all about the playa so we could see what everything is called in Spanish. There was one more book we found on our shelf with a picture of sea life. Little Guy had fun matching the pool toys to the pictures of the real animal on the page. So that is what we did this week! What did you do in your Tot School? 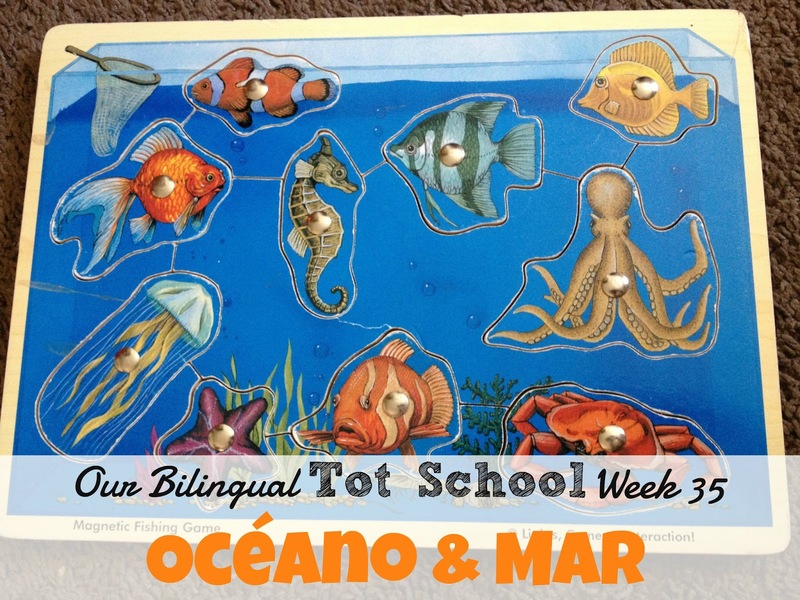 Is your Tot School bilingual? How do you integrate the two languages with your littles? I would love to hear your comments below! Haha, ALL my inspiration comes from Pinterest ;) Love the mirror activity! I know! What would we do without Pinterest?! :) Thanks for the comment, glad you stopped by! And of course, the best one is the spontaneous fun. I love your "OM"!